"The energy and joy are contagious in this practice. Michael calls up the positive child in us that hasn’t played in a while. It’s movement that becomes meditation before you even realized it’s happened. Unscripted, expertly guided. This rollicking mind/body connection balances out quieter practices like yoga and meditation. Michael has created the ultimate stress-buster." 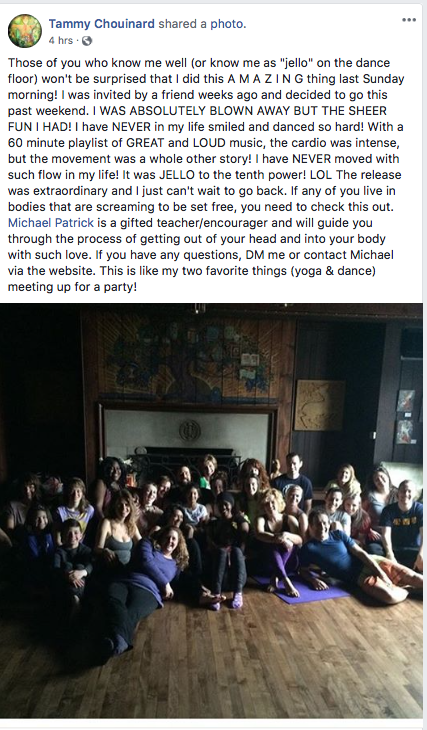 "My school brought Dance Meditation and Michael Peters in to teach a group of our students and help them bust through fears, discover strengths they didn’t know they had, and gel together as a community on a whole new level. Our students LOVED Dance MT and our staff loved it, too! 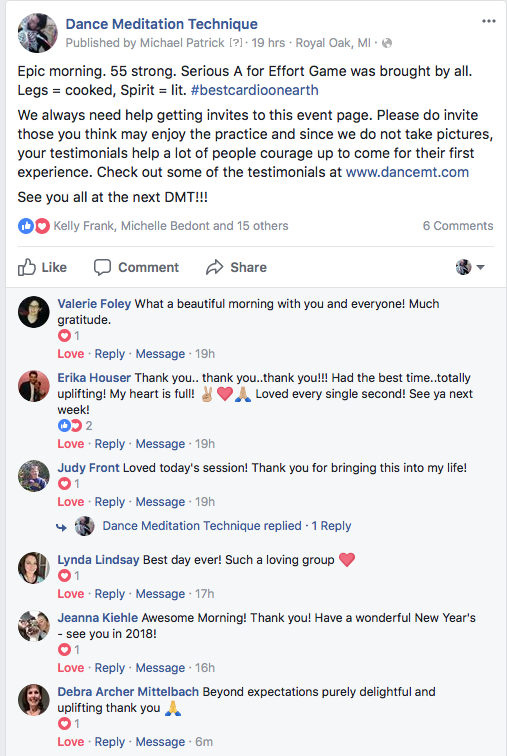 We highly recommend bringing Dance MT into your organization, your studio or wherever it is that you have groups of people who are ready for the best mind, body, spirit workout of their lives." Michael Patrick Peters-a big personality with so much passion and heart and a wonderful presence in the room really helps people let down their walls and connect to something permanent and soulful. I was amazed at how easily students were able to break free from their attachments and dive into exploring something outside of themselves in a safe and secure environment. “I have to say, something in me changed at the Dance Meditation Technique last night!!!!! Flyer says drop 100 pounds of emotional weight, I felt like I lost that and more!!! Oh it was beautiful, I wish there was a DMT every week!! Thank you Imagine Do! 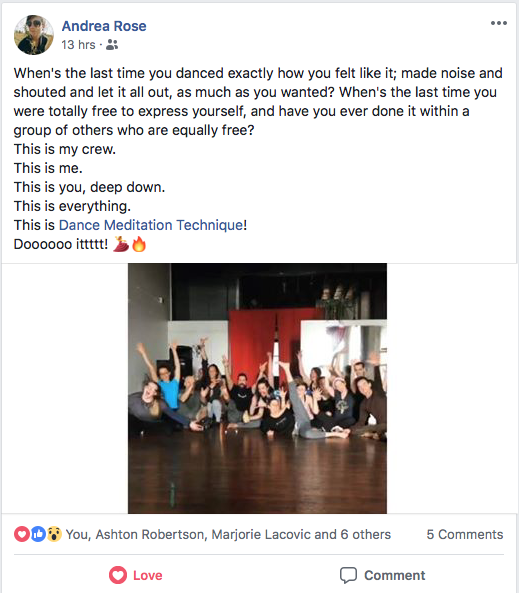 “I was at your DanceMT event in Brooklyn on Saturday as part of Carrie’s tribe and wanted to share some thought about it with you. The experience was all I anticipated and more. It freed me in a way that I was not expecting and took me into an unexpected place/trance. During most of it I had a loop going through my head of “You are strong, you are powerful, you are beautiful and you are graceful.” These are not words that immediately come to mind for myself. Your laughter was infectious and I could not help by laugh along with you. Thank you for sharing your joy with us. 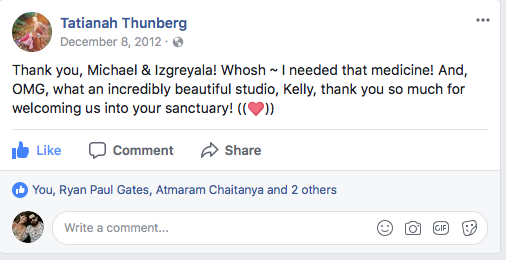 “Loved every moment of the Dance Meditation Technique. My wild came jumping out and released past energy. Now even more close to being my authentic self. Thank you for providing a safe space! “That big beautiful barn, full of Starlight! I have to say I’d never had an experience like this before. Yeah, I’d been out dancing in the clubs with friends, but that is an experience that is full of judgment, drama, and tension among other things. The DMT experience let go of all of that. It was so freeing. You got to let go of judgment, drama, and tension - on many levels - emotionally, physically, and spiritually. Letting loose, dancing your fool head off, and shouting to release your aggressions. The demonstrative experiment of black hole energy VS starlight energy at the beginning was profound. And once we identified the difference, got comfortable with each other and the beat dropped, it was ON! 90 minutes of pure release - energetic bliss! Thank you for your kind thoughts and words of wisdom, for holding the space and sharing this experience with others - I would more could experience it! And that joyous laugh! Infectious! Also, from my post on Facebook the day after the event, I’ve had so many people ask me about my experience. Once I explain it to them then they ask, “when is the next one? I must do this!” Helping to spread that starlight!